Two delightful videos featuring the poseable paper dog have been posted to the website on the same day! First, our friend Mr Cool has taken the spotty dog design and added it to the double crank mechanism making this rather splendid walking dog. 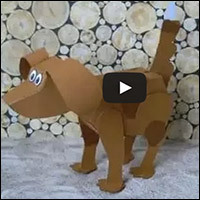 Next, perpetual friend of the website, Michael42er posted this stop motion video of the posable dog in action. Thank you both for your rather splendid videos! Hello cool, that idea is indeed out of the box. Michael's stop motion video very entertaining.